Brunch is served buffet style every Sunday alongside live Mariachi music. Restrictions apply. Not valid in conjunction with any other discount, offer, or coupon. Good for dine-in only. Not valid for take-out. Management reserves the right to modify or discontinue the offer without notice. Offer good Monday - Friday during regular business hours excluding holidays and special events. 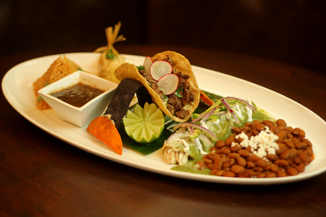 Taco Rosa Mexico City Cuisine serves inspiring and authentic flavors for brunch, lunch and dinner that are deeply rooted in Mexico City.